‘Gringo’ is a messy kidnap thriller about a businessman who finds himself caught up in a conspiracy during a business trip to Mexico. That businessman is Harold Soyinka (David Oyelowo), by all accounts a decent guy who has recently discovered that the pharmaceutical company he works for is going forward with a merger that will see him lose his job, albeit his boss and supposed friend Richard (Joel Edgerton) denies that this is the case. In addition to this, he is in a great deal of debt and his marriage is breaking down, leading Harold to make an irrational decision to fake his own kidnapping to take advantage of a company insurance policy for that very circumstance. If the above sounds a bit messy and a bit all over the place, it absolutely is and ‘Gringo’ throws a lot of material at the wall, hoping that it’ll stick, but in spite of this I did get a lot of enjoyment out of the movie. David Oyelowo is a large part of that and I found his Harold easy to root for, mainly because every other character is completely insufferable. Oyelowo has mainly played dramatic roles in the past so this venture into more comedic territory is new ground for him and I thought he did well with a character written as not much more than a sad sack. The conspiracy element doesn’t play as well in reality as I imagine it did on the script and there are too many elements and characters thrown in that leaves the narrative feeling overstuffed. For example, alongside the primary plot with Harold and his colleagues played by Edgerton and Charlize Theron, there’s a subplot involving Harry Treadaway and Amanda Seyfried that eventually links to the main plot tenuously, but the film never finds a way to really justify their existence and this subplot could have been removed entirely. ‘Gringo’ is filled with similar examples to this and it often feels like its overindulging itself and it starts to overplay its hand. 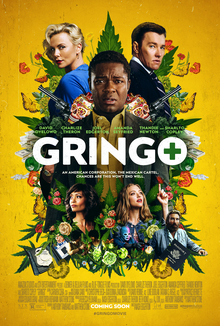 Some of ‘Gringo’ is really funny and I really liked the faked kidnap scene, with Oyelowo doing his best work, but this is a shaggy kind of film that starts to lose its way as it piles on more outrageous layers upon an already overstuffed narrative. That being said, I did find a lot of the film pretty funny and enough of the story worked for me that I had a good time overall!